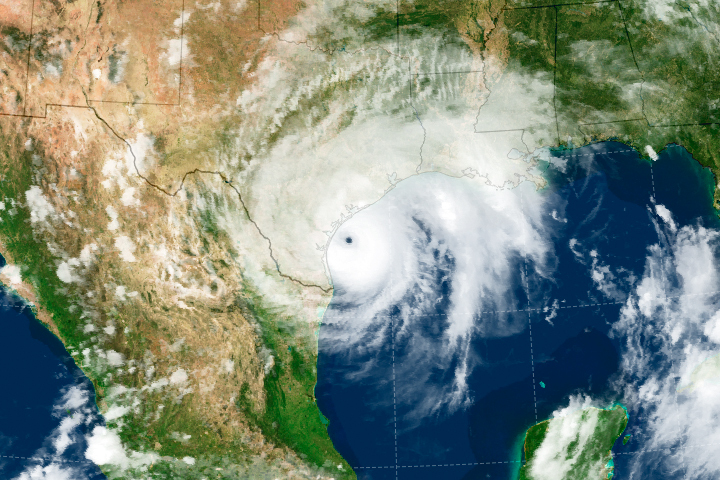 Hurricane Harvey changed the landscape of southern Texas and the lives of millions of people. 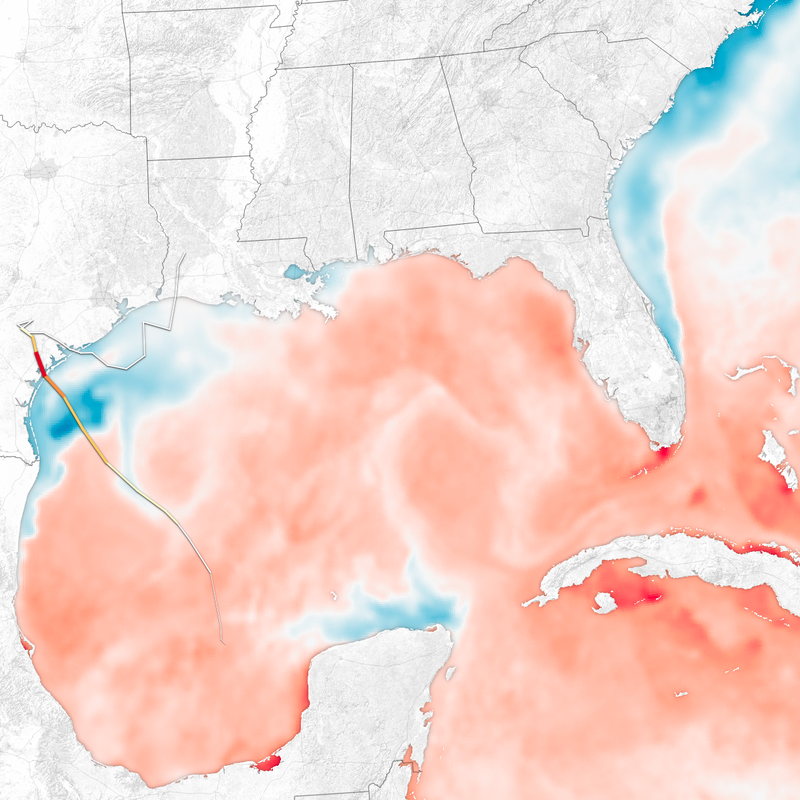 The storm also changed the surface profile of the Gulf of Mexico, though those effects are likely to be short-lived. 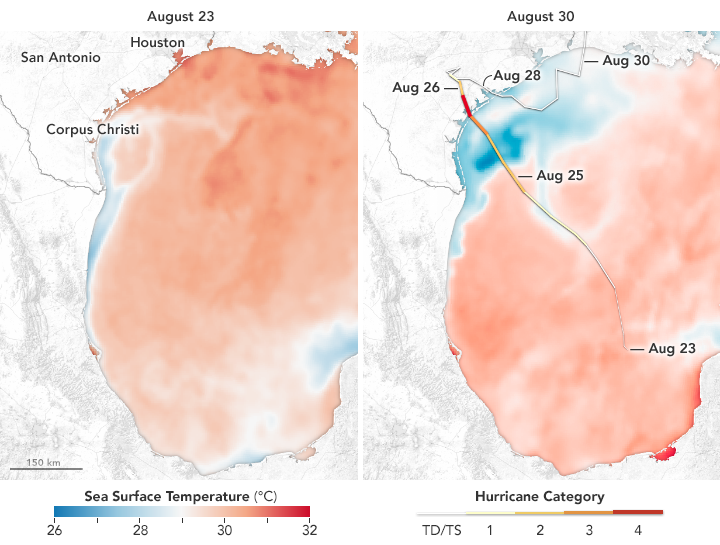 When Harvey crossed the Yucatán Peninsula into the Gulf of Mexico on August 22–23, 2017, the tropical depression moved into waters that were 1.5 to 4 degrees Celsius (2.5 to 7 degrees Fahrenheit) warmer than the long-term regional average for sea surface temperatures. 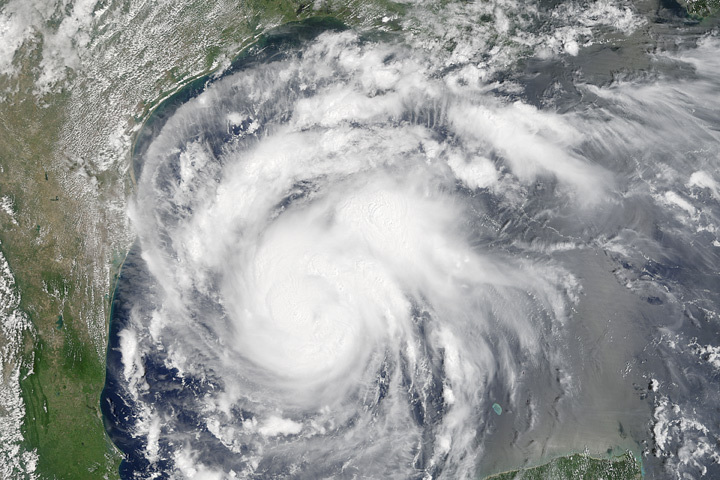 Hurricanes feed off of warm ocean temperatures, like a fire relies on a steady oxygen supply to keep burning. 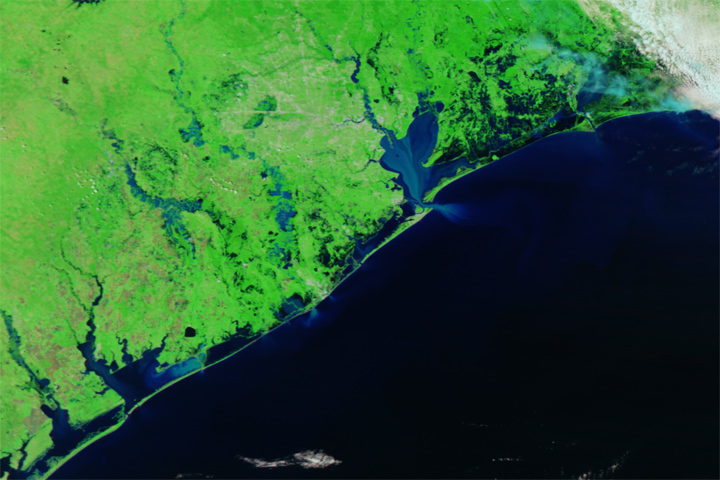 “So this deep, warm pool of water helped provide additional fuel for Harvey to intensify,” said Dalia Kirschbaum, a scientist and natural hazards specialist at NASA’s Goddard Space Flight Center. 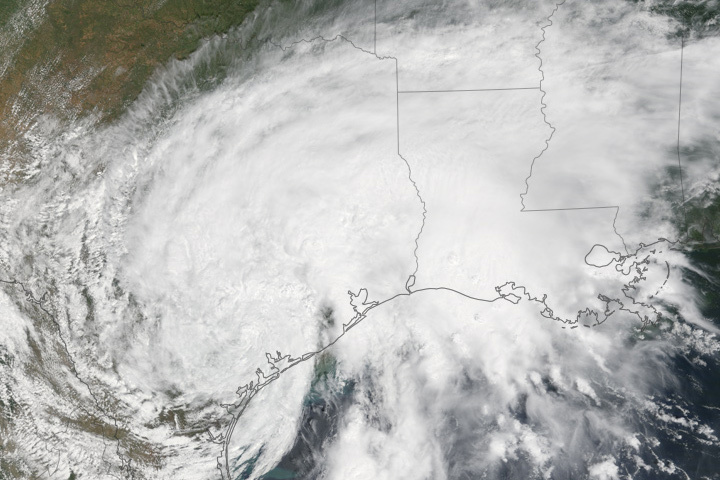 Once in the Gulf, Harvey grew rapidly and sped toward the Texas coast as a category 4 hurricane—then lingered for five days as a potent tropical storm. 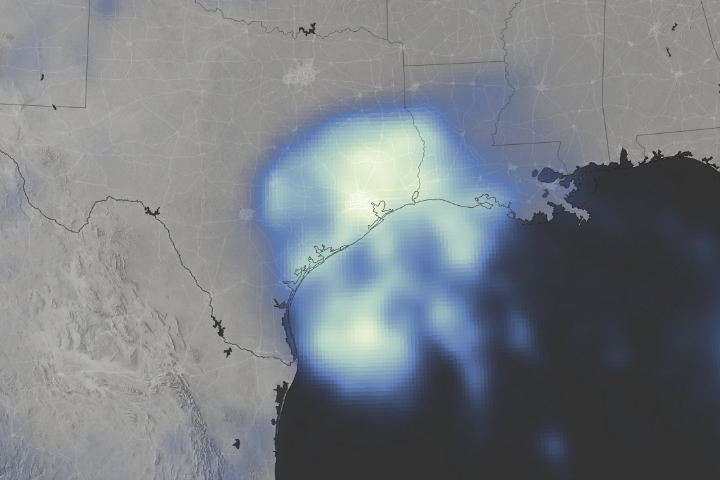 In the process, the storm dropped unprecedented amounts of rainwater on Houston and southern Texas while churning up the Gulf of Mexico. 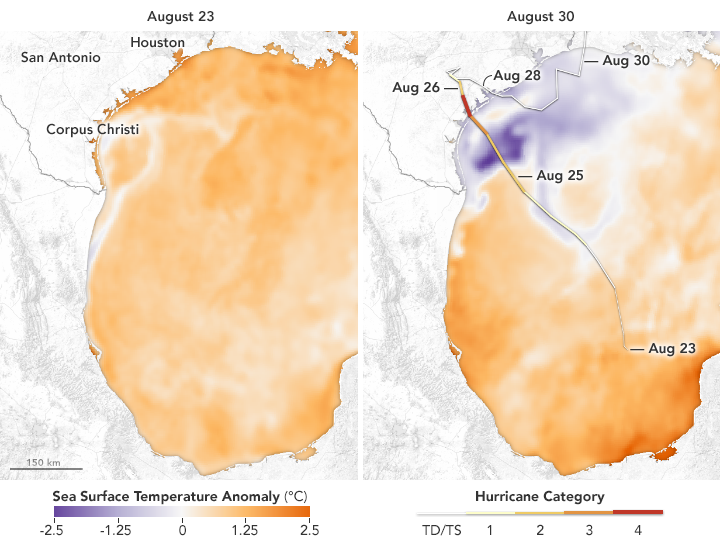 The maps at the top of this page show sea surface temperatures in the western Gulf of Mexico on August 23 and August 30, 2017, as well as the storm track for Harvey. The second pair of maps shows sea surface temperature anomalies; that is, how much the surface layer was above or below the long-term average temperature for this time of year. 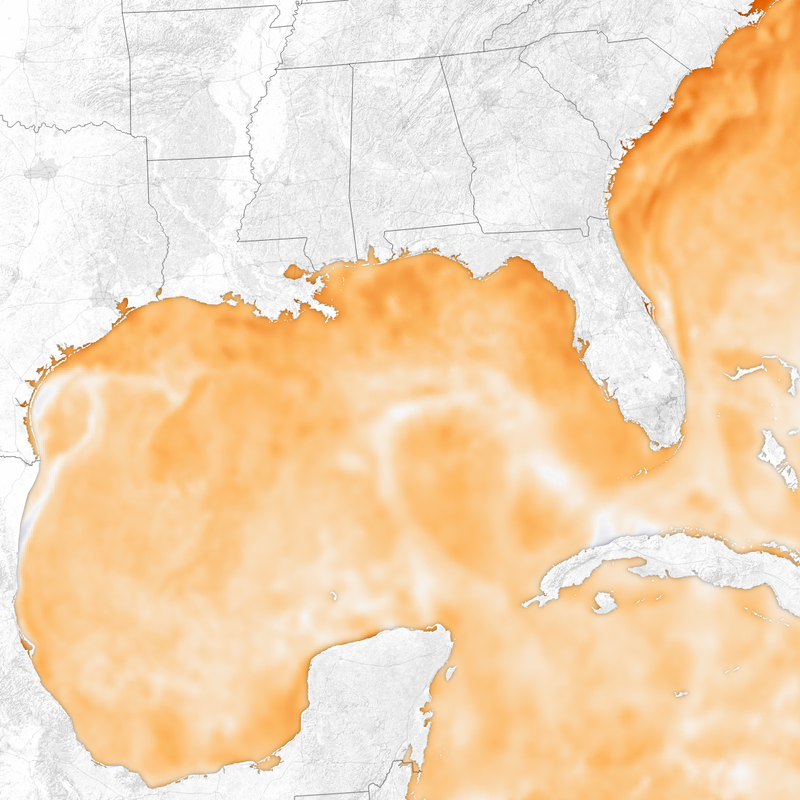 The data for all of the maps were compiled by Coral Reef Watch, which blends observations from the Suomi NPP, MTSAT, Meteosat, and GOES satellites with computer models. 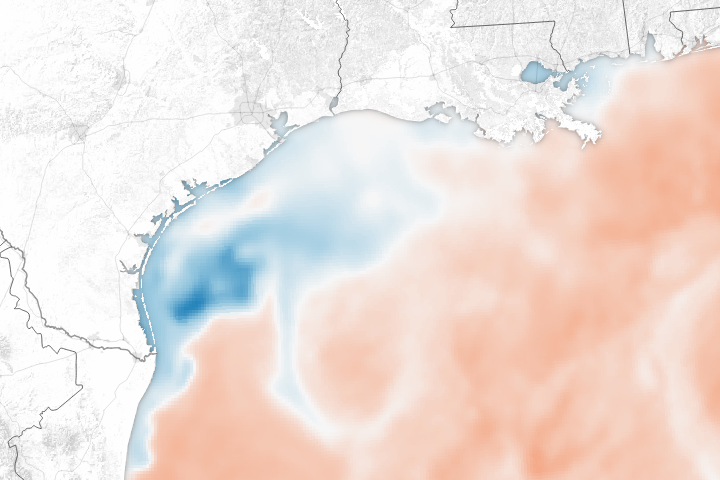 All of the fresh rainwater and the ocean mixing from the storm combined to dramatically alter the surface waters of the Gulf. Cooling naturally as it rose through the atmosphere, the water that fell back onto the sea as rain likely would have been cooler than the surface waters. At the same time, the winds and waves of the storm worked to disperse warm surface water and to bring up cooler water from the ocean depths. 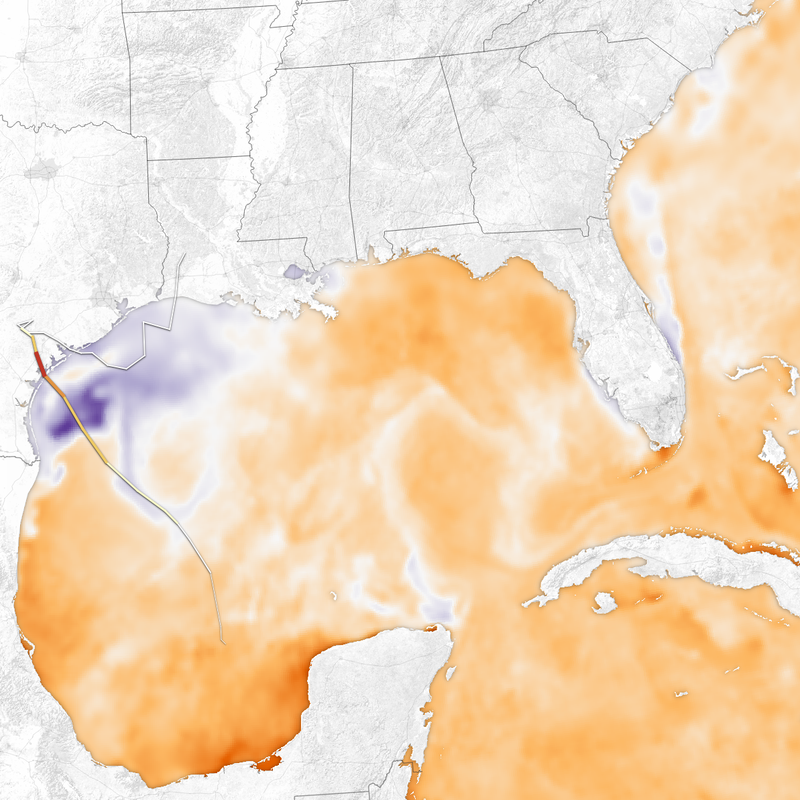 In theory, the cooler water now near the surface of the northern Gulf of Mexico should make it less likely for a new storm to develop or intensify there in the coming weeks. However, the waters of the Gulf are not exactly cool. 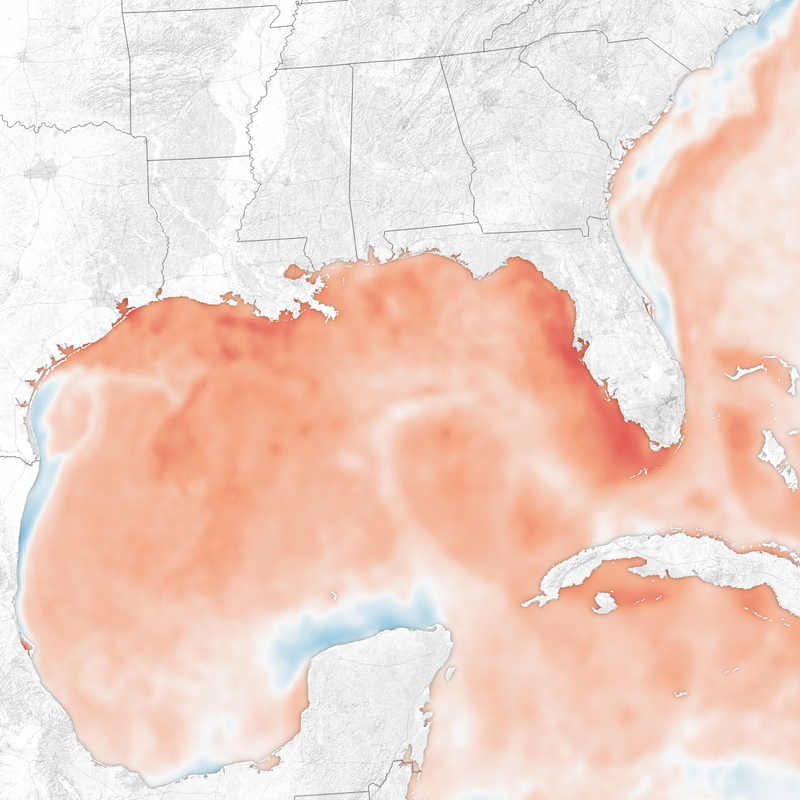 Scientists generally agree that sea surface temperatures (SSTs) should be above 27.8°C (82°F) to promote the development and intensification of hurricanes. (There are some exceptions.) So even some of the light blues on our sea surface temperature maps are still warm enough for storms. 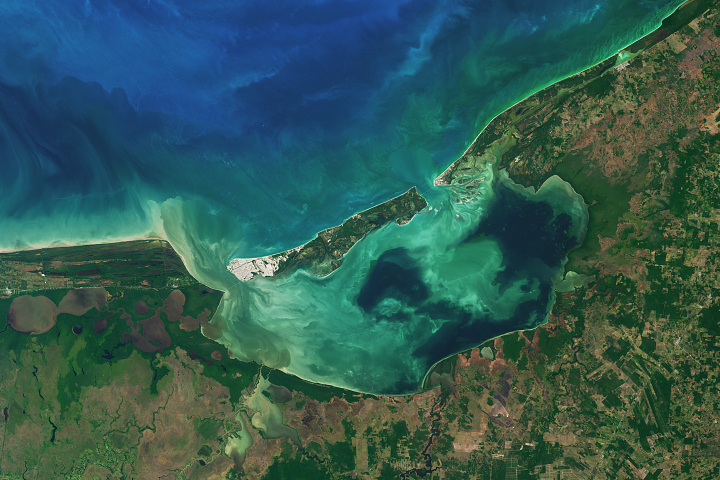 NASA Earth Observatory images by Joshua Stevens, using data from Coral Reef Watch and Unisys. Story by Mike Carlowicz. Cool rain and runoff, combined with the overturning of sea water, has cooled off the sea.